You know it's easy to get overlooked in the jazz world today. There are too many musicians on the scene from all over the world. The market is flooded with more new CD's than we can really handle and every day there are dozens of classic reissues showing up to add to the competition. Often if a musician really has something to say musically they are ignored for not fitting in with the style of the day or possibly they're looked at as just too old or too normal. A jazz life is surely not an easy one. 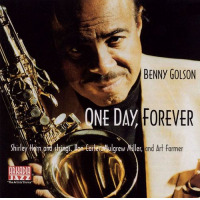 The great saxophonist and composer/arranger Benny Golson has had more lives in the jazz world than Morris the Cat. He seems to come and go every few years never quite taking off like the talent he possesses would dictate. But none the less, like all great musicians he seems to ignore his ups and downs in the public eye and keeps his nose to the truly important task at hand, to continue to nurture the skills that God gave him. And what skills this great man has! I was fortunate back a few years ago to get a chance to meet and record with this great genius of the saxophone. One of the trio's I play in is called Three of a Kind (Bruce Cox - drums and Dwayne Dolphin - bass). For our second recording we had terrific success using the great Stanley Turrentine as a special guest and we wanted another guest for our third. 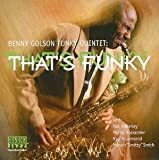 We chose Benny Golson and hoped he would arrange one of his classic compositions for the recording. I'm sure you've heard or played at least one of his many standard jazz pieces: "Stablemates, "Whisper Not, "Blues March, "Killer Joe or one of his many others. He brought with him an incredible sextet arrangement of his most famous piece "Killer Joe. For this piece we added Till Bronner a wonderful trumpeter from Germany and the amazing Conrad Herwig on trombone. What a treat for me to play this classic jazz tune with the composer himself! I had chills up my spine as we recorded it. 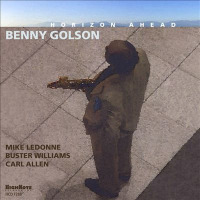 Mr. Golson has such a great warm sound and he plays with the energy of a sixteen-year-old. Amazing! As for the other pieces on the recording, we recorded seven of my compositions and a couple of standards. One of the best compliments I've ever received (being a little shy about my writing skills) came from Benny when he said he wished he had written a few of my pieces. I was thrilled to say the least. On our lunch break I discovered Benny to be a very talkative and intelligent man with lots of stories to tell. 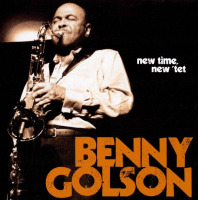 He liked answering questions about the good old days and proved his memory to be quite amazing as he talked about gigs he had done in the fifties with Lionel Hampton and Dizzy Gillespie and about the formation of the Jazztet with Art Farmer in 1959. He talked about many gigs he had played with his long time partner Curtis Fuller and his days as a writer for television and commercials. He told us about seeing Ornette Coleman's big debut at the Five Spot in 1959 as well as seeing Trane and Monk play there too. It was exciting hearing him recall many memories that obviously were very important for his own life and I was touched by his openness. 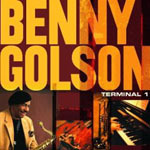 Go out and see Benny Golson play if you can! He's really amazing.